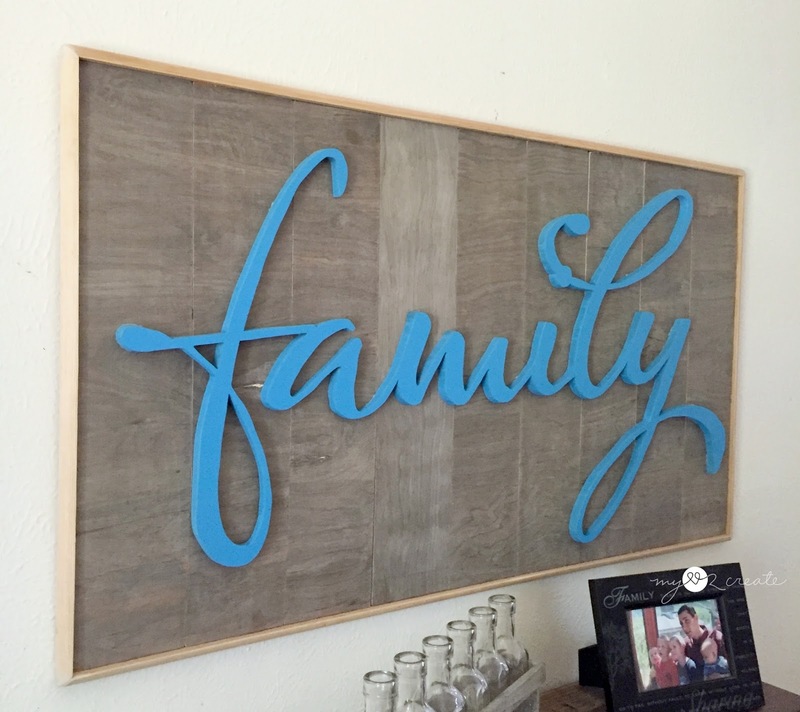 I am sharing a fun project today, a DIY Family Cutout! 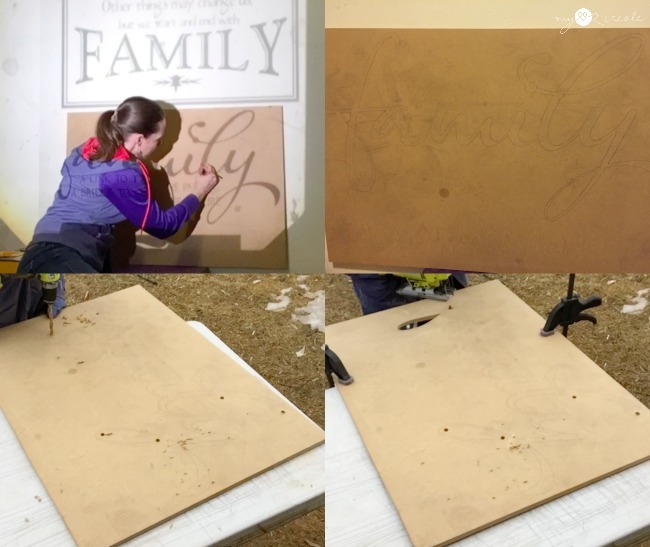 The coolest thing about this project is that you can cutout any word/name you want! You have limitless possibilities, and it really is pretty easy. 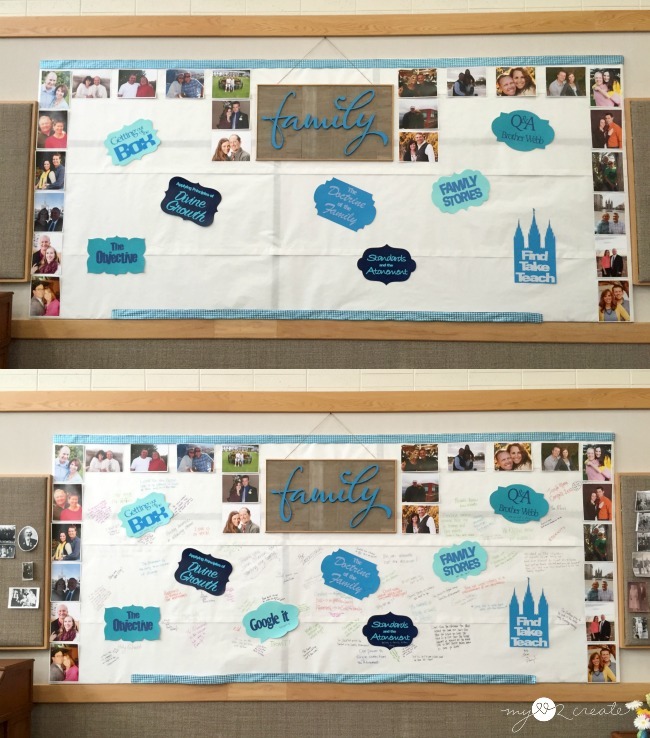 I made this Family cutout for a conference my husband and I attend for his work every year. The theme was Families, so obviously this was the best word to use! I actually made this in January, so when you see me all bundled up and snow on the ground don't get confused! 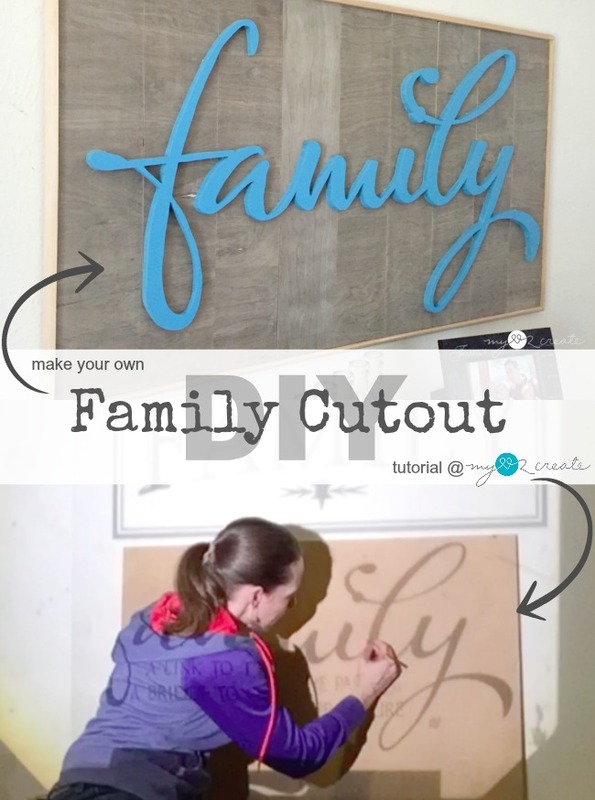 How to make a Cutout Word: This post contains affiliate links that help me at no cost to you! 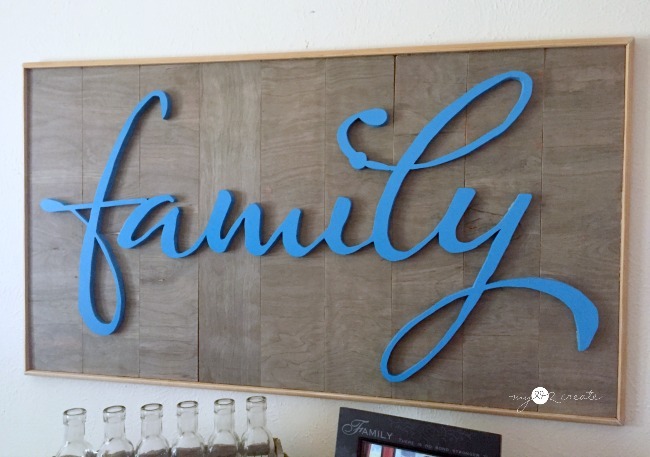 I knew I wanted to used the word "Family" so I went to one of my favorite sites for getting SVG files (I use them to cut things on my Cricut Explore Air Wireless Cutting Machine ) and found this design and purchased it. You can download it in multiple formats, this time I just used the jpg file so I could print it on a transparency. You can see in the shot above I have my board against the wall and my image projected and ready to trace. 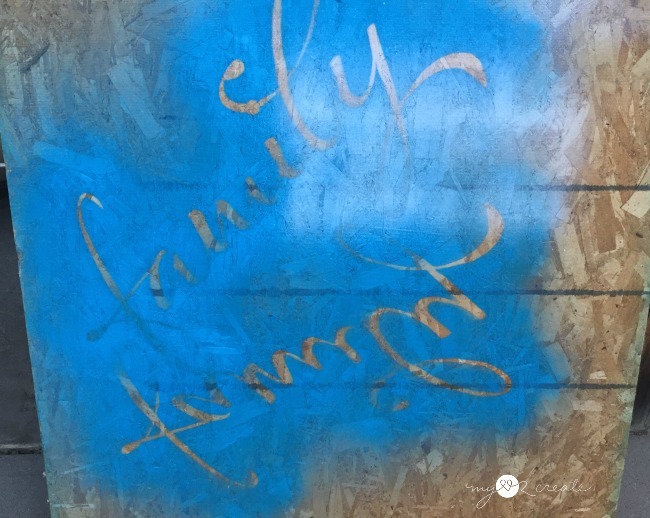 I only traced the word family and ignored the other words in the image. I set to work tracing around all parts of the word, and it was now ready to be cut out (top right). To start cutting I first got out my drill and a bit that was big enough for my jig saw blade to pass through. 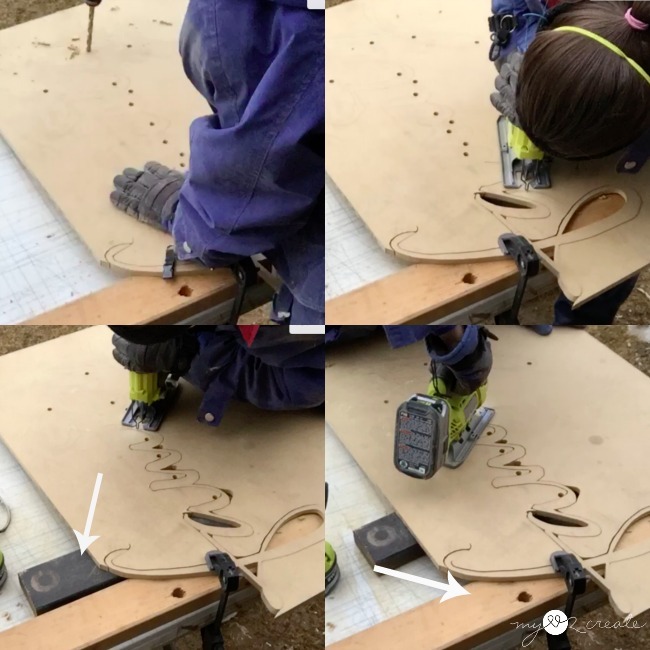 In the bottom two shots above you can see I have started by drilling holes in the inside parts of the letters, this way I can put my jigsaw blade in the drilled hole and cut out the inside parts. Then I just slowly guide my jigsaw on the line to cut out the shapes. In these shots you can see I have propped the board up onto some scrap 2x4's and clamped it down (always clamp when you jigsaw). This allows my jig saw blade to cut without hitting my table. I drilled more holes and used my jigsaw to cut out the letters. If you look close, you can see I also drilled holes on the sharper turns between letters, just to make it easy. You can stop and start your jigsaw anytime and go a different direction, to make your cuts clean and easier. Go a slow speed and pace yourself. The arrows are showing that I needed more support as I continued cutting towards the middle of the word. It is vital to support your newly cut parts of your word, as they can be flimsy and you don't want to risk breaking it. *It is also important to note that you need a Scrolling jigsaw blade , they are smaller, thinner, and made for cutting curves. I only had one scrolling blade while doing this project and I accidentally broke it when I stopped cutting to take care of some issue with my kids. I had no time to go to the store so I grabbed a regular blade, which is bigger and thicker. Long story short it was MUCH harder to cut with and eventually caught on one of my 2x4's on my last turn and broke the word in three places. Ugh!! 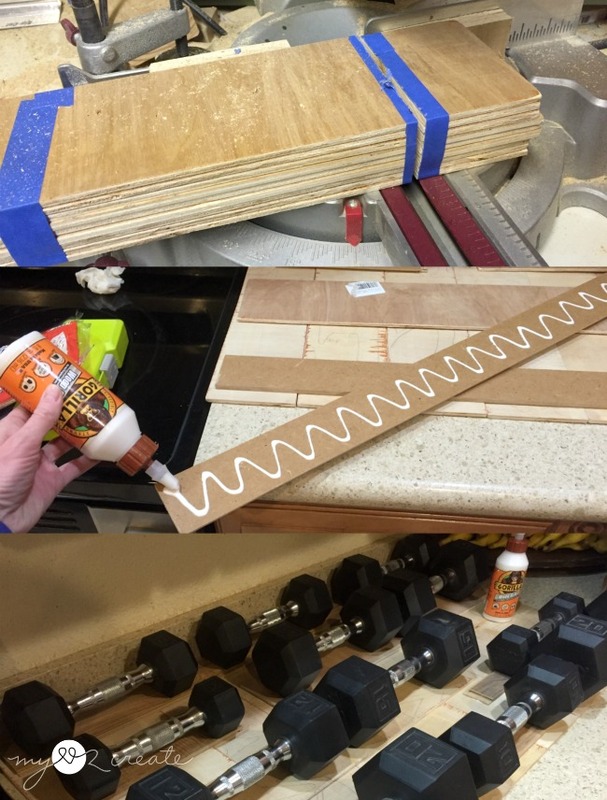 I used some left over 1/4'' plywood for my backing, but I didn't want just a flat piece, so I cut in in strips with my Kreg Rip-Cut (obviously I forgot to take photos of that too...) and then bundled them all together with painter's tape and cut them to the correct length all at once (top). That is a very useful tip, I do it all the time, which saves me time. Woot! To secure all the strips together I used some of the left over short pieces and also scraps from my teen boys bedroom makeover, when I put flooring in their closet, to attach the planks on the back side. 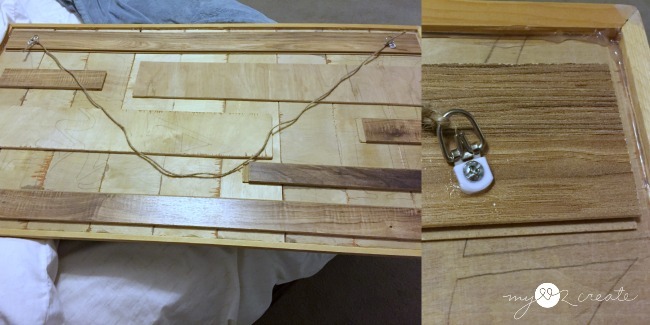 I used wood glue and lots of weights to "clamp" it until it dried. 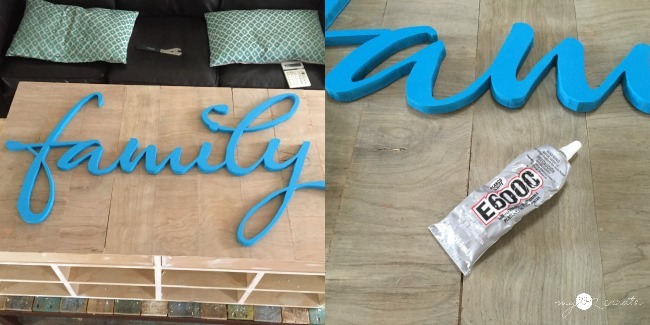 With my planks together and my word spray painted I was ready to glue...but wait? Did you notice the wood changed color? I used my natural stain to make the plywood look old. Then, I covered the back of the word with E6000 and placed it on my planks and added weights to the top of my word to clamp it down while the glue dried. At the last minute I thought it could use a border, so I cut some scrap quarter round moulding to fit around the planks, and glued nailed it in place. Because the wood was so thin, I also ran a bead of hot glue on the back around the whole frame to secure it even more. I placed d-rings to each side for hanging onto screws in the wall. Of course when the conference was over I got to keep the sign...which is why I made it a cutout instead of using poster board, like I used on the rest of the graffiti wall, because I knew I could use it in my home! It hasn't found a permanent spot yet, I have moved it around a couple of times, but I love it and am so happy to have a reminder of what is most important hanging in my home! 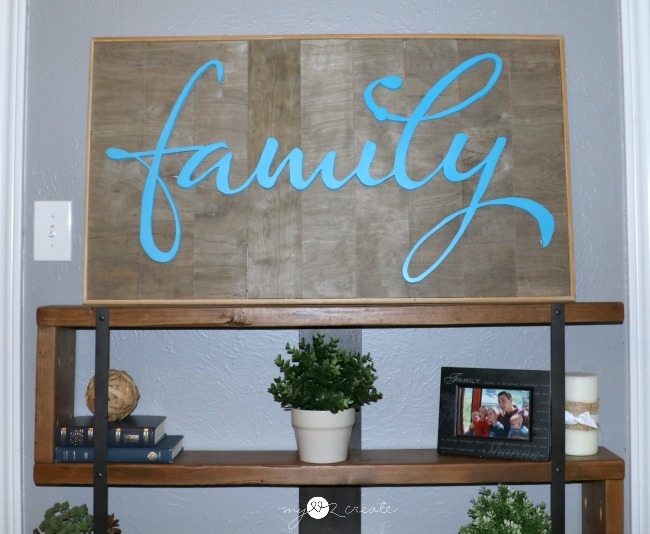 I hope you are inspired to try making your own cutout word! You can totally do it, start on a scrap piece of wood and do some practicing, it isn't very hard! Now for even more cool projects! 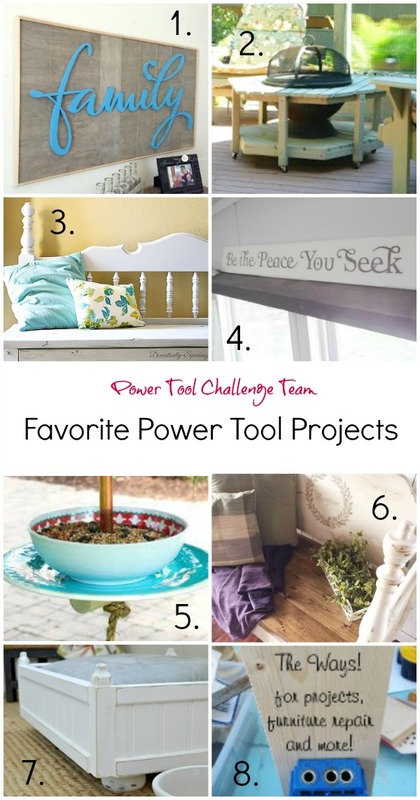 I am sharing this as part of my Power Tool Challenge Team project this month. We are doing an anything goes theme using some of our favorite power tools! Go check out all these awesome projects for more inspiration, and don't forget to give them some comment love! Thank you so much for stopping by! I would love for you to follow me on Pinterest and Instagram! Wow Mindi, those are some intricate cuts - you rocked the jigsaw on this one! Mindi! You always wow me with your jigsaw skills! I have to say it might be my least favorite saw. I think I don't use it enough to improve my own skills. You inspire me girl!! pinned because I LOVE this project! I love this! When I first saw your picture I was expecting that you used some sort of fancy piece of equipment to make this. I have a jigsaw but I'm not sure if the blade is a scrolling one. If it isn't, I need one! 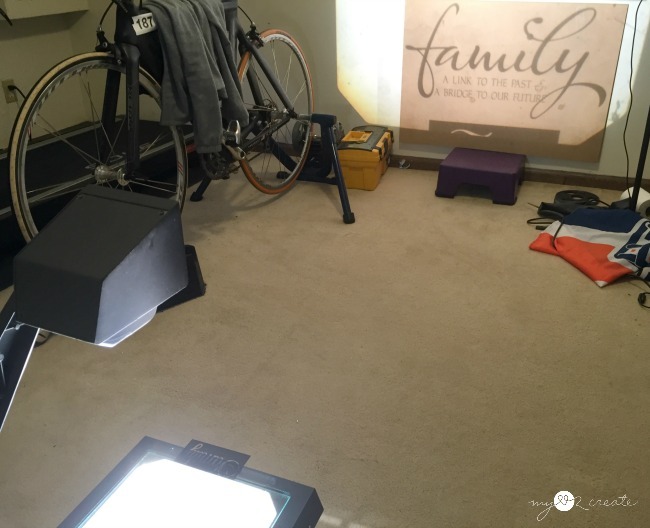 Since I no longer use my overhead projector at school, I house it at home. :) You should see how many are in storage in my science closet! You have some mad jigsaw skills! I love it! I need to make something like this for my stairway gallery wall! Thanks for the inspiration! Beautiful job on that, Mindi. I'm glad you were able to glue the parts back together, that's happened to me! I do lots of cutouts with my jigsaw and I find it works much better if I cut on the back and not the front because of the up pull of the blade. Is that what you find, the cut is neater on the back? That is really awesome, Mindi! You did a fabulous job of cutting the word out with the jigsaw (the jigsaw and I do not get along!)... and I love the weights! What a cute sign! Great tutorial! I just learned something new! I did not know you could buy a scroll blade for your jigsaw! Thank you for that! I love how this turned out… Your hubby is lucky you're so talented! This turned out great and love how easy it is to make. Thank you for sharing at Dishing it and Digging it link party. We love having you. I am pinning this project for sure. Such a neat idea! Thanks so much for sharing the how to! It makes a lovely display in your home too. Thanks for linking up with us for Brag About It! Pinned to share. SO pretty! And I always start out projects thinking I can be really handy, and then I get really frustrated part-way through when things don't go quite as planned. Way to be resourceful and make it work. It looks awesome in the end!